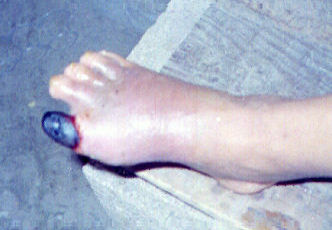 Doroteo Correa presented himself at my office in Xaibe village March 13, 2000, with a severely infected right foot. Mr. Correa is a diabetic II for the past ten years or more. Three weeks prior to his visit, he had developed a sore on the upper part of the sole of his right foot, just below the big toe. This was treated by conventional medical practices through the use of a strong antibiotic regimen along with vasodilators. The sore did not respond and the infection spread rapidly. The day Doroteo came to my door he had just released himself from Orange Walk Hospital where he was being prepped for amputation of his entire right leg – just below his thigh. The infection had already progressed to his upper shin. Doroteo suffered from multiple ulcers over the bottom of his foot. One, in the heel, was quite deep. Two more on the upper part the foot’s sole were the results of surgical incisions from previous medical care – an attempt at debridement of infection. He also has a large infection in the top part of his foot – from toes to ankle – that had not yet broke through. His leg to just below the knee was discolored and in high “fever”. The infection was quickly developing into a systemic problem. Doroteo had lost much of his weight – had no appetite and was very anemic – at an HGB of just 6.8. Doroteo immediately started a Cascabel therapy of 20 grams per day for a 3 day trial period; with clear instruction that if the fever of his leg did not reduce he must return for the amputation. Doroteo returned 3 days later. The “fever” in his lower leg was much lower down – now just below the ankle. His appetite had returned. He felt much better. His wounds were discharging heavily. This always a good indication of therapy activity. Continued treatment for seven more days. Great improvement. Surgical cuts on sole of foot healed. Infected large toe has turned very black but base of toe is showing new flesh. Much exuding of fluids from hole at base of toe. Appears to be fluids draining from large, submerged, abscess in upper foot area. No “fever” in foot though. No pain. Appetite is good. Foot now very painful and inflamed. "Black" toe has a bad odor. Necrotic flesh falling off. Doroteo is eating well and still in good spirits. The large toe, however, is dead. Therapy was started to late to save it. Increase in inflammation. Toes are swelling. Much less pain. Sole of foot healing well – including ulcer in heal. The dead toe must be amputated for further healing to be effective. Curing is now preceding well. No inflammation or pain. No new infections. Progressing well – though slowly. Suspect anemia as cause of slow progress. This deep and pernicious ulcer is resolving well with time. Healing well. Walking with crutches. Doing well. Sore in heal closed over. Photograph of entire foot. Surgical cuts healing well. New Flesh has begun growing to cover previously exposed joint bone. Belize Doroteo is recovering well from his anemia now. The cure should start progressing in a more rapid manner. Healing progressing well. Patient feels very good. Including four pictures to track the progress. The wound is growing over well. I include a detailed picture of the old heel ulcer. This was a large and deep ulcer when therapy was started. At present - the residual scab has separated, we know see how complete the cure is. Mr. Correa has been stabilized for over three months now. This part of the therapy is simply the regeneration of flesh and bone. As we see in these first two pictures, the wound is almost totally healed over. In the picture of the entire top of the foot – we notice inflammation. Less than before – but still there. This is due to his walking while healing. He will continue to have the immune system reaction of inflammation when exercising his foot until his wound is totally cured. There is little or no pain involved – unless he walks too much. – at which point he does experience low-grade “soreness”. With Cascabel therapy – wound debridement occurs “naturally” as required. There is never a need for surgical intervention. The final picture is of the man himself. One can hardly but notice his greatly improved condition. He is extremely robust and very healthy.